Audio recordings come in two basic types; analog and digital. Analog refers to audio recorded using methods that replicate the original sound waves. Vinyl records and cassette tapes are examples of analog mediums. Digital audio is recorded by taking samples of the original sound wave at a specified rate. CDs and Mp3 files are examples of digital mediums. 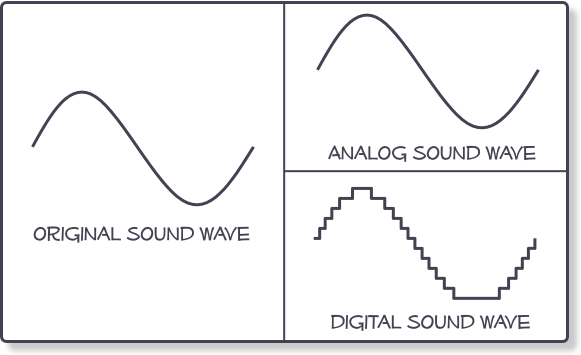 As you can see from the diagram, the analog sound wave replicates the original sound wave, whereas the digital sound wave only replicates the sampled sections of the original sound wave. The potential fidelity of an analog recording depends on the sensitivity of the equipment and medium used to record and playback the recording. Among other factors, digital audio fidelity heavily depends on the rate at which the recording equipment sampled the original sound wave over a specified increment of time. Even with the newest technologies and techniques, digital audio still cannot create exact replications of an original sound wave. Many times, digital audio companies try to hide this fact with fancy words like “Uncompressed” and “Lossless”. These words are very misleading as all digital audio features some compression and loss of the original signal. However, even the best trained human ear may not be able to tell the difference between a high quality digital signal and an analog audio signal. An easy way to visualize digital audio is to consider the difference between a regular light bulb and a strobe light (Those lights designed to flash on and off very quickly. Commonly found at concerts or Halloween displays). In this example, an analog audio signal is comparable to a regular light bulb, whereas a digital audio signal would be similar to a strobe light. A strobe light can flash so fast that you hardly notice the moments when it is off. Digital audio players have become the portable audio device of choice for many people these days. Considering the many benefits of portable digital audio devices, the popularity is justified. Just a few years ago, it was unheard of for someone to carry around thousands of songs with them. Nowadays, thanks to digital methods of audio recording and storing, entire music collections can be carried and played back through a single device small enough to fit in a pocket. This convenience sometimes comes at the cost of fidelity. In mobile/casual listening environments, or if average quality playback equipment is used, the fidelity offered by digital audio may be sufficient for most people. However, for those audio purists that want the very best fidelity possible, and use really high quality playback equipment, digital audio may not be the answer.